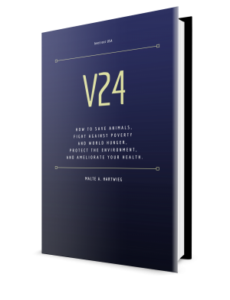 V24 – The Vegan Book – Jeder Tag zaehlt. Here´s a copy of my book V24 which already embellishes the desk of many presidents and prime ministers all around the world. I hope you like it, too. Even if you´re not ready to go vegan, this book contains many ideas on a more compassionate lifestyle. All relevant information about diet change, with nutrition tips and with many super delicious recipes. The vegan lifestyle has made you curious? Then give it a try. Live vegan for 24-days. This guide will help you. Come on and go for it!